In the Armenian cathedral in Lwów, a fresco by Jan Henryk de Rosen depicts the funeral procession of St Odilo of Cluny. 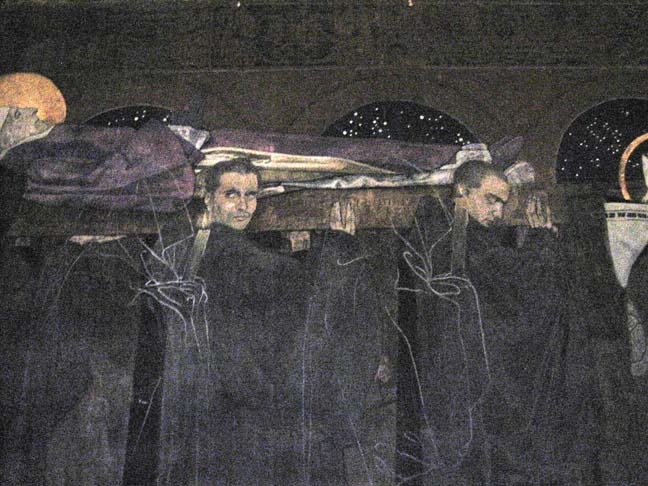 His body, carried by the Past (hooded), the Present (looking at us) and the Future (eyes shut) is accompanied by a procession of the ghosts of the dead. This would logically be the direct inspiration for “All Souls’ Day” — the more so, since St Odilo instituted All Souls’ Day itself — except that I saw the fresco in August 2009, and “All Souls’ Day” was written a year earlier. It must be a coincidence; if you believe in coincidences. If you really want a saint and a historical parallel, “All Souls’ Day” is more related to the life of St Charles Borromeo, who toured Switzerland at a time when even the bishops didn’t believe anything any more and had turned to making money from magic and sorcery (they shot at him, but missed). But that too was something I only spotted after I’d finished writing the story. In the end, “All Souls’ Day”, like so many of the stories in this book, is really a love story: in this case, about a friendship that endures through everything and anything. Read the story when it appears on this blog next Monday. But why wait? Christmas is almost here and the book is out already, so buy it now! Rudyard Kipling is the greatest writer of short stories I know. His versatility is astounding: from history to children’s stories, from romance to pioneering science fiction… and ghost stories. Kipling wrote a ghost story called “They”. My story has nothing to do with it except its title and one plot point, but I still offer it as a sort of homage. Read the story when it appears on this blog next Monday. But why wait? Christmas is coming soon and the book is out already, so buy it now, for yourself and your friends! In Ovid’s Metamorphoses, three goddesses visit the new-born hero Meleager and give him a lifespan as long as that of a log that is burning on the hearth. His mother seizes the log, pours water on it, and hides it safely away. Many years later, angered by his crimes, she makes a bonfire and throws the log onto it. The “external soul” has been a part of mythologies since human beings began to think and to tell stories, and in parts of the world it still is. It was a sign of Oscar Wilde’s genius that he was the first person to add a moral dimension. No-one before Wilde had come up with an object that is not only tied to a man’s life but shows, visibly, the state of his soul. I am not Dorian Gray. My passport photograph does not change (or perhaps I am just too dreadfully good) — and when the cover designer tore it up so that she could illustrate the cover, I didn’t feel the slightest twinge. My “Dorian Gray” story is faster and much lighter than Wilde’s: a social comedy, in fact. The action takes place within less than 24 hours. It’s told from the point of view of a woman — intelligent, predatory, but inexperienced — who starts to suspect who her skiing companion might be, and discovers the truth by destroying his photograph. 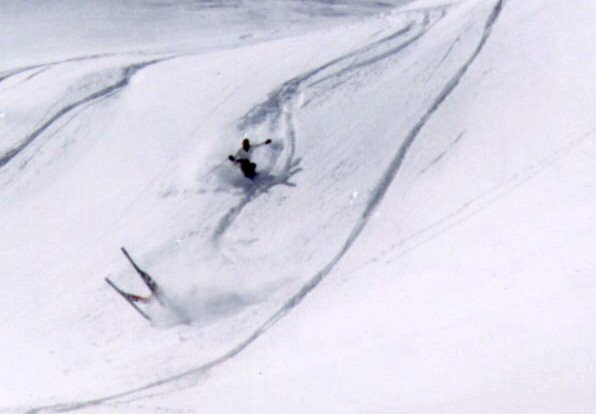 It was in St Anton. I never met him, only heard of him. He was an Australian ski bum who sat on the railway line to write postcards but had his Walkman on too loud, and the train came. From that seed something has grown that is different, and bigger. A new kind of ghost: one that everyone sees, one that you don’t want to be without. The American hockey players are drawn from life as well. Read the story when it appears on this blog next Monday. But why wait? The Snow Cow was published last week, so you have no excuse any more. Buy it now! If you’ve enjoyed the ePub previews that we’ve been putting on this blog, you can now get the whole of “The Snow Cow” in e-book format from Shortcovers.com, to read on your iPhone, iPod Touch, Blackberry, Palm Pre, Android, or Sony Reader device. And on your PC or Mac, as well. Actually quite a few have been sold already because Amazon jumped the gun, but now is your chance to get the book officially, and fast. Click now, and in a couple of days you’ll have the book in your hands!